The Moon-Fairy danced happily through the garden at night. She sang as she danced in the moon’s soft light. “Make wishes! Make them stick, make them stay…”, she sang. She wasn’t afraid of the dark – no way! 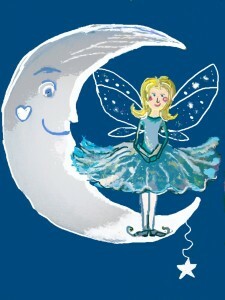 The Moon-Fairy will get you dancing and singing your fears away! When you think you’ve got a troll under your bed, or you think there’s a monster that needs to be fed – the Moon-Fairy will help you change your mind. There are so many funny friends for you to find – in Natasha’s Wood. “Make a wish, make it stick, make it stay and dance your fears away. All you have to do is believe,” sang the Moon-Fairy. This Art Campaign is not yet open.